The Lean educator in me is always looking for effective ways to teach and reinforce Lean Thinking. I recently had the opportunity to review a great educational product called the Lean Product Cards. 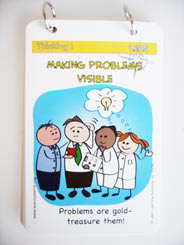 The Lean Thinking Pocket Cards pictured above were created by Pascal Dennis teach Lean concepts with a light touch. The images are funny, intuitive, and teach concepts fundamental to the world's most powerful business system. Each card illustrates a core Lean Thinking concept and contrasts it with conventional thinking., to prompt your thinking and guide you to your True North. Topics covered: Leadership, Problem Solving, Planning, Simplicity, Pull, Flow, Standards, and Quality at the Source. 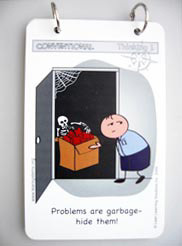 A few months ago the Lean Learning Solutions Team lead by Pascal released the Lean Tools Pocket Cards . The twelve Lean Tools cards are designed to provide you with a visual overview and detailed view of the most common tools used in Lean organizations. Topics covered include: Strategy Deployment, Waste, Visual Order (5S), Visual Control, Standardized Work, Total Productive Maintenance (TPM), Problem Solving, Problem Solving Tools, Kaizen, Kanban, Poka Yoke, and Quick Changeover. Learning and changing thinking requires constant reflection and reinforcement. As the saying goes "a picture is worth a thousand words" these visual cards are extremely powerful. These cards can be used by executives to machine operators and everyone in between successfully. They are small and durable so you can carry them everywhere and refer to them as you need. I recommend these cards for any organization looking for educational materials to reinforce their Lean Journey. My organization is going to use these and the Lean Leadership Pocket cards coming soon. Buy your cards today. Thanks for the review. I'll definitely look into adding these to our in-house training materials.